As een on his IG account. In the this video from MTV (1:27), Bonobo plays the Prophet 5 through the Eventide Space pedal. 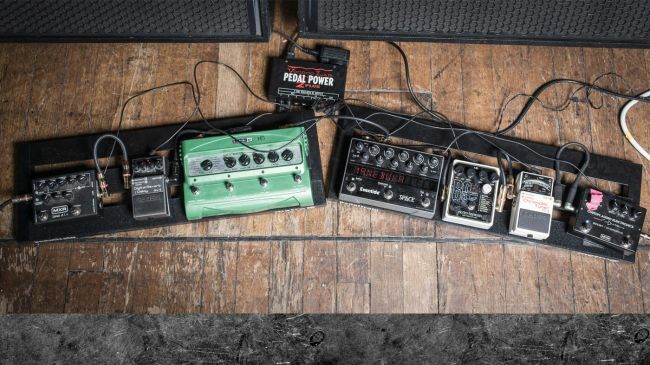 According to Death Cab for Cutie's Ben Gibbard in this Premier Guitar Rig Rundown, "I've never been happier since I went to the [Eventide] Space... Reverb pedal," he said at (17:45). He uses it at 2:30. At 0:16 Jacques Greene's Eventide Space can be seen near the bottom middle of the screen. Richard Devine worked with Eventide to have presets available for the [Space Reverb](https://www.eventideaudio.com/products/stompboxes/reverb/space). He is featured prominently on the product page as having downloadable presets and is the sole artist mentioned on page 5 of the [full list of Space presets](https://s3.amazonaws.com/com.eventide.downloads/Product+Manuals/SpacePresetGuide.pdf). Also, he lists the Space frequently in citing gear he uses on his YouTube channel. 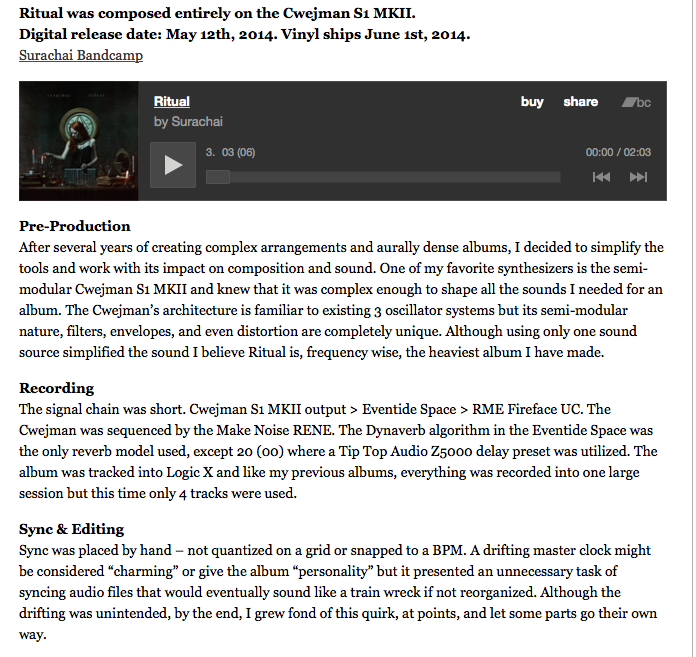 For example, in [this video entitled Strum](https://www.youtube.com/watch?v=welwHZhSyks), the Space is visible throughout in the upper left and in the description he says: > The entire mix was sent into the Eventide Space pedal using the "Corridors" patch. Jimmy runs this pedal between the speaker out from his amp, and the input of the Crown power amps. It is set 100% wet, and a volume pedal manipulates the volume of the reverb. "Eventide Space Reverb. Set to a slightly modified version of ‘Black Hole’ setting. This was pulled out by Dave Sitek at the start of the sessions for “BE” and used throughout that album, not just on guitars but on just about anything and everything. As soon as I heard it I ordered one, and I used it live on Beady Eye songs such as “Flick Of The Finger”, “Soul Love” and “Dont’ Brother Me”." According to Premier Guitar, Scolnick uses the Eventide Space Reverb. In this photo, we can see Bazan's settings for Eventide Space Reverb. His pedal emulated the plate reverb at the time. From Tone King video, explaining his effects setup, with Jeordie and his guitar tech, as a guitarist instead of his "traditional" role as bassist (at least live) for Marilyn Manson. In this photo shared to his Instagram, we see Matty has bought the Eventide Space pedal. He uses it heavily in songs like "Chocolate". This reverb pedal has also been pictured on the Instagram pedalboard shot. At the beginning of the video, we can see Bryndis's pedalboard, which includes the Eventide Space Reverb pedal. 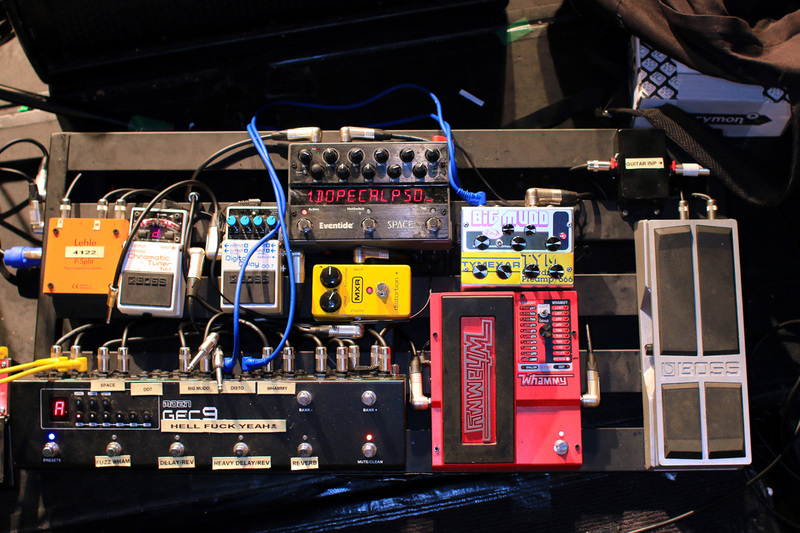 This image of Brynjar's pedalboard is the complete set-up. This was taken from the [Strymon website](http://www.strymon.net/tag/brynjar-leifsson/). At the middle of the board is the Eventide Space pedal. "I am using about five pedals. Two of them are Eventide pedals. 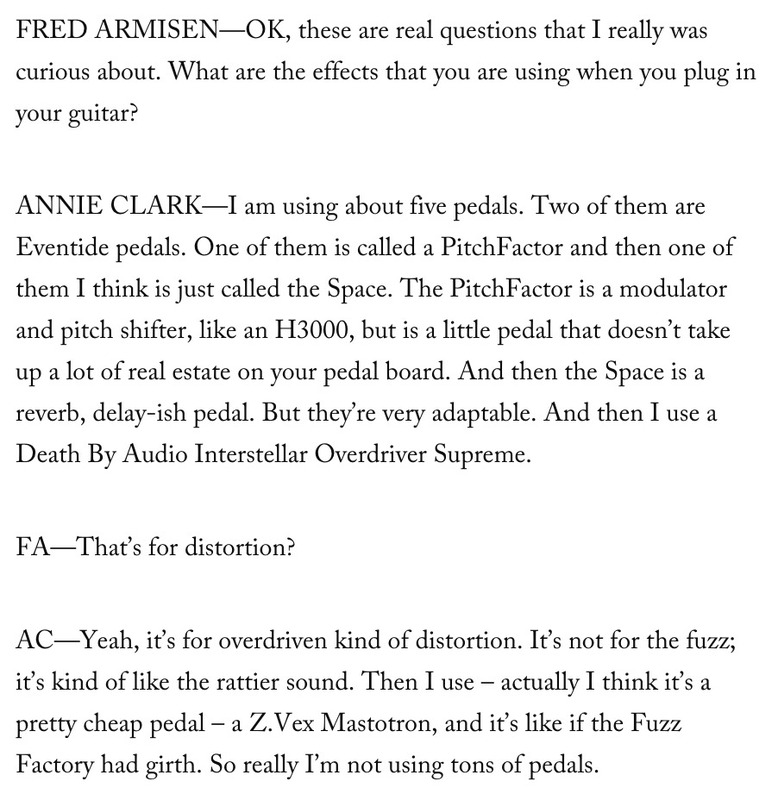 One of them is called a PitchFactor and then one of them I think is just called the Space." St. Vincent in [this interview](http://thelabmagazine.com/2012/08/27/st-vincent/) with *The Lab Magazine*. At 1:39 Amedeo Pace says "Its something I can always have on", referring to his Eventide Space. The Eventide Space is used on one of Ryan's boards backstage. He runs it through his VooDoo Lab Ground Controller. 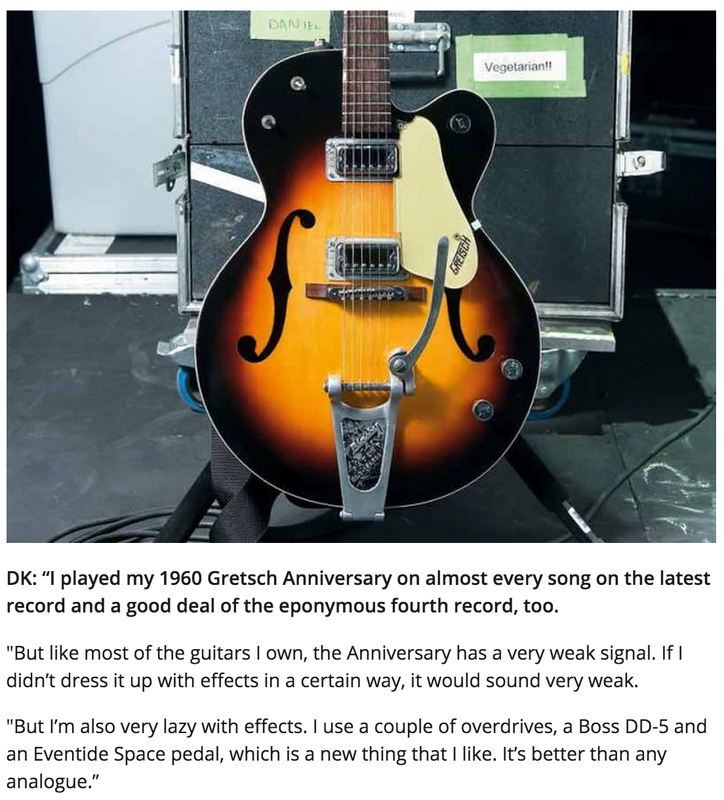 It can be seen on one of his pedalboards in a picture featured on this blog from July 15, 2015. There is an Eventide Space on Harry's pedalboard. Brian mentioned the Eventide Space pedal when asked what his favourite pedals were. Dallas' Eventide Space pedal can be seen in the "After" photo on the top row, two from the left. The article from Nice Rack Canada states, "The switcher also has a HotSwitch & Tap Tempo for the Eventide Space that Nice Rack Canada suggested to eliminate the “high mileage” Holy Grail & Digital Reverbs." In these photos from a shoot for Guitarist Magazine an Eventide Space Reverb can be seen. Surachai talks about the process of developing his album, Ritual, in [this article](http://trashaudio.com/2014/04/surachai-ritual/). He says, "The signal chain was short. Cwejman S1 MKII output > Eventide Space > RME Fireface UC." The Eventide Space pedal is shown in this picture he posted. An Eventide Space can be seen in this photo of Hernán's pedalboard, posted to CARAJO's [Facebook](https://www.facebook.com/carajoband). In this Instagram post, Nigel Hendroff is clearly using the Eventide Space on his pedalboard. An Eventide Space can be seen at 0:20 in this video of Classixx performing for KEXP. "So, I had to get into all that and setup everything. I bought myself a new computer, a keyboard and some more outboard synths like the Dave Smith Mopho x4, the Tetra and a MFB Dominion X, plus a few effect pedals such as the Eventide Space". The item can be seen into the entire video. On the top left corner of Andy pedal board, there is a Space reverb pedal by Eventide. He is using this Pedal at Tomorrowland 2016. Seen on Instagram stories - 'vocal board'. At 22:06 minute mark, Eventide Space Reverb can be seen. In this pedalboard photo taken by Hatherley on her Instagram profile, the Eventide Space Reverb can be seen. It can be seen above his right hand, in his studio. > I'm also taking a Roland TB-303, Niio Iotine Core, MFB-522 drum machine, Eventide Space, Strymon Timeline and MPC 1000. The title of the video states that MIDERA is using the Eventide Space pedal. Chris Carter has an Eventide Space Reverb in this image of his live setup. "Experimenting with a new major upgrade in my tape loop setup - the Eventide Space reverb pedal!" An Eventide Space can be seen in the lower left corner of this picture from Clark's Instagram page. In November of 2015, the Eventide Space Reverb Pedal was used by German guitarist Hanno Busch as part of his live pedalboard set up. In this Instagram post, Alan can clearly be seen to have an Eventide Space Reverb on his board. EG: What equipment did you use when writing/producing and recording this album? Aparde: "I’ve used selected and familiar hardware instruments and effects like Moog Minitaurus, Prophet 08 or Red Panda Particle and Eventide Space Pedal, among only self-recorded sounds and atmospheres to create a unique and inventive soundscape." I know this is nominally a guitar pedal, but I use it mostly for my synths — and given how good the reverbs are, I use it a lot. This piece is so good that it made me buy two more Eventide boxes. Such a versatile reverb. You can get incredibly creative with the different algorithms. This is my go to reverb. I absolutely love this pedal. It has several modes and is so customizable that options borderline limitless... Not cheap nor easy to use, but it's bbuilt like a tank and has a badass look. This is a remarkable pedal. There are some really OTT sounds in here but there is plenty that's useful. I love the spring emulation and the fact that it comes with a very amp-like tremolo that is linked to the hot switch by default. Halls and plates are suitably high quality. Blackhole is out there on its own - what an algorithm! You can spend days with this pedal and never get tired of it! Simply one of the greatest reverb /effects pedals ever! This pedal will give you endless variations of reverb. I dig this pedal and use it for everything from slapback to giant reverbs. I traded a BigSky for this. They are similar but Space is more intuitive and dark. I have only just got this, so I have not had much time to play on it. I have heard the sounds that this box produces and they sound amazing. This pedal will send you to outer space though the cosmos far far away from that pale blue dot you call home. The presets alone on this digital reverb pedal are amazing. I must admit as soon as i received this pedal i became a huge "shimmer" fan, something about it that has allowed it to become one of my top reverbs. If you ever get the chance to try one out I'm sure you'll be purchasing one shortly after. Most versatile reverb pedal on the market. Can go from soft reverb to huge delay reverb effects. can blend chorus with reverb, delay with reverb, has tap tempo to get the effects in time with a song or songs. Can program effects output to each preset which is a huge plus. Has Kill Dry so can use with a mixer 100% wet. I have even got some cool PCM 60, 70 & 80 sounds out of this pedal. Has expression jack to blend effects. It does take some time to program and tweak, but worth the time. The Eventide Space Reverb stompbox is ultimately one of the best reverb pedals in the game. While having a wide selection of reverbs and delays to choose from, it also offers high quality sound in all of the available presets, fitting for a number of different genres of music and styles of playing. On top of that, the many knobs on the stompbox allow for easy manipulability in the event that the sound the guitarist is trying to produce is slightly more complex than what's already offered as a preset. Overall, I love the dozens of presets, and have enjoyed creating my own sounds with the Space! Space is the Ultimate Reverb pedal. I did a lot of research on reverb pedals, came close to buying Ezhi & Aka Terverb or Empress Effects Reverb, but finally chose Eventide Space, and am so glad I did. Many other reverbs are outstanding devices, but this is really professional, studio quality sound, advanced algorithms, and cool presents, 80 of the 100 are by famous music artists. Space will take you to 6 levels above where you are now!